We tailor a holistic financial plan specific to your financial dreams and goals. Within that plan, we can utilize various investment strategies and insurance products, including annuities, depending on your unique situation. From tax-efficient strategies to investment advice to protecting some of your assets — we’ll cover as many bases as possible to help you create a strategy that supports your retirement lifestyle and long-term financial goals. Most importantly, we serve as a fiduciary. As an independent investment advisory, we are product and service agnostic. Our loyalty is not to a company, but to you, our clients. All of our decisions and recommendations are designed to be in your best interest, and we act in a reasonably and prudent manner. We believe every investor deserves accountability. If for any reason you are not completely satisfied with our services during your first year with our firm, we will refund 100%* of any fees that you may have paid to our firm during our initial time together. We make the commitment to you because we are confident of the level of service we provide and that you will be happy with your results. You won't find that kind of accountability everywhere – but you will find it here. * Pertains only to the management fees that were paid to the Curran Financial Partners during the first year together. The request must be made during the first anniversary year based on when accounts were established with Curran Financial Partners. Fees cannot be reimbursed from any third party such as internal mutual fund fees, custodial fees, or fees associated with insurance and annuities. Access your complimentary copy of “The Power of a Plan” now! 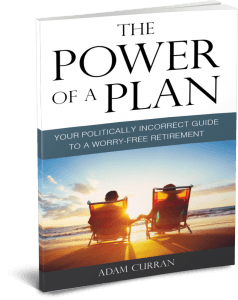 Fill out your information to receive “The Power of a Plan: Your Politically Incorrect Guide to a Worry-Free Retirement” and we will get in touch with you to send a paperback copy. Investment advisory services offered through Curran Financial Partners, a South Carolina Registered Investment Advisor.